Warehouse planning and inventory management processes in today’s global logistics business environment are critical success factors to effectively manage our organization’s corporate collaboration, peak performance, job efficiencies and bottom line. Smart Business spoke with Reichman about the relationship between information technology and inventory management and about how to maximize it in your organization. What impact does IT have on warehousing and inventory management effectiveness? Utilizing methods including automatic data capture and barcode scanning to track inventory levels allows your employees, customers and vendors to effectively sort, view and manage information flow, providing a real-time window into your warehouse operation. Inventory is essentially like cash sitting on a shelf because you are paying for those items and that storage space. The longer it sits there, the more it depreciates in value. 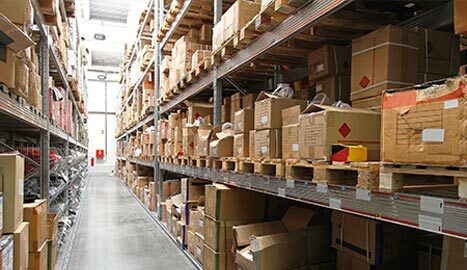 When you use technology to group tens of thousands of goods within any given warehouse, the software solutions will analyze data sequences and track the historical demand of each product to ensure the most optimal on-hand availability, order replenishment and efficient processes of your merchandise. In addition to tracking the supply activity and shelf life of your inventory, IT solutions will also sequence the data in order to provide the most efficient layout and product placement plans within the warehouse. That way, the most high-demand products are closest to your organization’s pick-and-pack operation, supporting workflow agility, lowering staff requirements and limiting job redundancies. It is quite literally a physical and mental impossibility for a human to perform these functions. Technology dramatically increases and enhances warehouse productivity, utilization and profitability. Describe warehousing in a just-in-time (JIT) environment. What are the advantages and difficulties associated with that environment? Implementing a just-in-time warehousing environment allows supply chain professionals to order and purchase inventory before it is needed, making your production operations more cost effective and streamlined. If properly implemented, it can enhance business value and warehouse efficiency while cutting down unnecessary steps in the movement of materials. However, unpredictability is an important variable to consider when touting the benefits of a JIT environment. For example, delays along the supply chain, such as port strikes or inclement weather, are inevitable. When these emergencies occur, they dramatically disrupt the JIT operations of your business, sometimes with extremely costly consequences. If you haven’t allocated alternate resources to compensate for those delays, you aren’t just running the risk of losing profits, you run the risk of losing crucial customers. Similarly, while technology can report downward trends of inventories, it can’t predict unforeseen consumer demand fluctuations. In some instances, you can buy inventory in anticipation of forecasted demands, only to discover that by the time the product actually arrives, the demand for that product in the consumer marketplace has either regressed or no longer exists. Suddenly, because of the abrupt swings in buying patterns as dictated by the laws of supply and demand, you are left with obsolete, excessive or slow-moving stock and its associated inventory carrying costs. The challenge then becomes maintaining adequate inventory levels without staging an overabundance of goods. What system challenges are involved in inventory management? One challenge involves conflicts or breakdowns in communication in getting two operating platforms to speak to one another. For example, our inventory is our customers’. Synchronizing our software systems with theirs, the customer accesses all product descriptions and quantities with a few clicks of the mouse. Upon selecting a product ID, a purchase order is printed, the barcode is scanned, the system is updated, and the order is packed and sent directly from the warehouse. However, if the two systems aren’t integrated correctly, or there is an internal glitch in either system, the information exchange will be inaccurate. Another primary challenge involves receiving companywide commitment and follow-through to the various resources involved, particularly from a cost of implementation, training and maintenance standpoint. However, it’s imperative to point out the hard-to-quantify future gains and benefits of effective inventory handling. It maximizes the productivity of your staff, reduces transcription errors and ultimately improves customer service metrics. You can’t ignore the definitive advantage; it drastically improves your bottom line. Bill Reichman is vice president of information systems of AIT Worldwide Logistics, Inc., headquartered in Itasca, Ill. Spanning numerous nationwide location and an every-increasing network of international partnerships, the global transportation and logistics provider delivers tailored solutions for a wide variety of vertical markets and industries. Reach him at (800) 669-4AIT (4248). Let AIT help your business cost-effectively move goods around the world. Learn how AIT can improve your supply chain.